Add mango to the long list of fruits that go with pork! 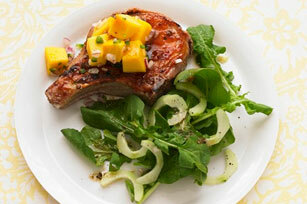 Enjoy it here in this recipe of barbecue sauce-glazed chops with mango-jalapeño salsa. Grill chops 4 min. on each side. Brush with barbecue sauce; grill 4 to 6 min. or until done (160°F), turning and brushing occasionally with remaining barbecue sauce. Remove chops from barbecue; let stand 3 min. Meanwhile, combine remaining ingredients. Serve chops topped with mango mixture. Serve with a side salad made with arugula and sliced seeded cucumbers tossed with additional Kraft Zesty Italian Dressing.